Millions of employees at more than 65,000 organizations rely on Uber for safe, reliable ground transportation when traveling for business across the globe. That’s why today, Uber for Business is unveiling new product updates, partnerships, and integrations, all aimed at making things a little bit easier for administrators and employees alike. It’s not surprising that business travelers sometimes forget to switch their payment method from personal to business when riding with Uber. These innocent mistakes are common with the rise of ‘bleisure’ trips that mix business and leisure – and they not only hinder productivity for the employee that needs to figure out how to fix the error, but also add extra steps for the travel manager or account administrator. At Uber, we set out to find a creative, technology-driven solution that would address this common pain point. 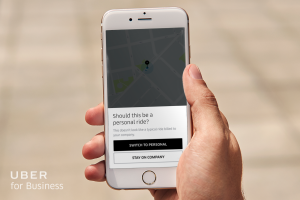 We’re excited to introduce profile recommendations as a part of Uber for Business. Using machine learning, Uber can predict which profile – and corresponding payment method – an employee should be using, and make the appropriate recommendation. By analyzing billions of Uber trips each year at an aggregate level, Uber can detect patterns and trends that predict the purpose of a trip. Based on early estimates, we expect employees will accept Uber’s suggestion eight times out of ten, which means 80% fewer headaches. While machine learning will go a long way in cutting down on errors, we want to make the experience as seamless as possible when there happens to be an oversight. Gone are the days where travel managers needed to review every single ground transportation line item. With trip reviewers, businesses can set custom reviewers for a given team or employee. Whether it’s a manager or an administrative assistant, the assigned reviewer can be anyone that might have a bit more context around the employee’s spend. And for those times when a trip is flagged by a reviewer, we’re now offering in-app trip resolution giving employees the ability to resolve issues directly from the Uber app with just a few clicks. Previously, employees were sent emails with information about the trips that required extra attention, but oftentimes email notifications were lost or forgotten, leading to cumbersome follow up from administrators. This new feature not only saves the employee’s and administrator’s time, but it also cuts down on delays associated with closing out reports. Uber for Business does more than just keep companies productive, it also plays a role in improving safety during business travel. Rolling out later this month, Uber for Business will be the first ground transportation solution to integrate with SAP Concur Locate, which helps employees stay safe while traveling for work. Thousands of shared customers across the globe will benefit from enhanced visibility into ground transportation, beyond flight and hotel reservations. Uber for Business already has a number of features that can assist Organizations across the globe in their duty of care, such as our integration with International SOS, so we’re excited to bring a new level of insight to assist to Concur customers in their obligations as well. Finally, as Uber expands its global footprint and serves more businesses in countries everywhere, it’s important that we integrate with all of the expense providers that our customers leverage. We already have integrations into Certify, Chrome River, Concur, and Expensify, and, over the next few weeks we’re rolling out new integrations with some of the leading providers from across the globe, including Expensya, Happay, Rydoo, Zeno by Serko and Zoho Expense. These new integrations will launch in early September. At that time, employees will be able to automatically import trip receipts to all of these platforms for a quicker and easier expensing experience. With these new partners, Uber for Business will be connected to more expense platforms than any other ground transportation platform, to the benefit of customers across the globe. We’re at Global Business Travel Association Convention 2018 this week talking about all of this exciting news and more. If you’re at the event, stop by Booth 3605 to learn about how Uber for Business can improve the way your organization works. Update: Uber for Business integrations with expense partners Expensya, Happay, Rydoo, Zeno by Serko and Zoho Expense are generally available to customers as of November 19, 2018.